Pipeline operators and integrity engineers are facing increasing pressure from regulatory authorities and environmental groups to guarantee pipeline network integrity. This is why it’s so important for them to understand the condition of their assets and perform the necessary inspections to correct potentially unsafe and critical conditions that could cause a catastrophe. "The safest way to perform integrity assessments"
Pipelines, as we know them today, were introduced in 1806 by the London and Westminster Gas Light and Coke Company. The industry expanded fairly quickly with increasing demands which followed with the evolution of construction maintenance techniques. Today, optical 3D scanners are the most advanced tools for integrity assessment. 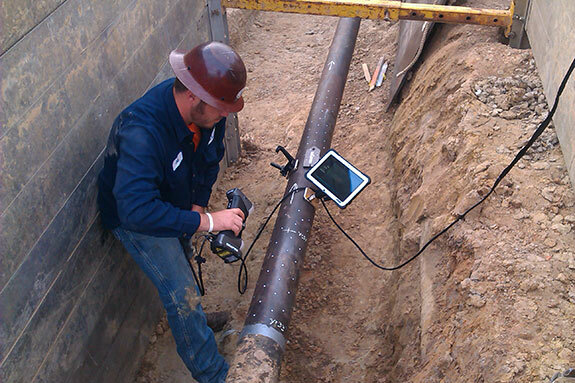 3D scanners are still considered as new tools in pipeline integrity assessment. They are very effective solutions compared to conservative calculation methods. In fact, the amount of information gathered by a 3D scanner makes it suitable for sophisticated assessments, providing more precise local depth readings to indicate if a pipe segment is fit for service. 3D assessment: How does it work? Scanned surfaces can directly be used in assessment procedures of pressurised components who are subject to local metal loss from corrosion, erosion or both. Surface data extracted from the scan data provides sufficient information to quantify a component for continued operations or rerating. Damage caused by pitting, mechanical issues or blend grinding that exceeds corrosion allowance can also be evaluated using 3D scanners in conjunction with the same assessment procedure. Metal loss assessments can be based on different industry codes and standards. Traditionally, corrosion assessment techniques reside on thickness profiles. Pit gauges are generally used for these types of assessments. A 3D scanner that can gather significant amounts of points per second is the ideal tool to maximise result accuracy, field efficiency, and conservative assessments. The ultimate goal is to determine the Maximum Allowable Operating Pressure (MAOP) or Maximum Fill Height (MFH) for tanks. Extracting the critical thickness profile is one of the most time-consuming operations during the assessment process and such operations can directly be affected by a technician’s skills. When using 3D scanners, users can capture the entire metal loss area and parent material surrounding the localised corrosion faster and easier. 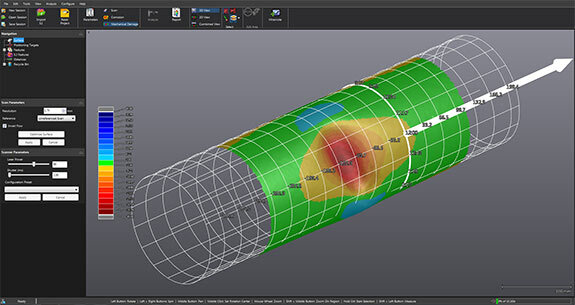 When combined with pipeline integrity assessment software, 3D scanners can automatically identify critical thickness profiles and outline the minimum thickness found on the scan data. This is a tremendous time saver for both data acquisition and integrity analysis. A new generation of software was initially developed in 2011 which is application specific and guides you through the right process to perform code-compliant assessments. Different than general 3D software, they are configured based on user requests. For example, parameters will be set differently if a customer wants to perform material loss assessment instead of mechanical damage analysis. By removing the complexity of high-density data handling and focussing on the application itself, recent integrity software gives direct access to advanced assessment techniques for better decision-making. Major causes of oil or gas spills can be listed in different categories. 3D scanners can generally help to assess damage caused by corrosion (external and internal) and in some cases mechanical damages that are usually the result of natural hazards, excavators, or agricultural activities. All assessment procedures that were developed to evaluate pressure boundaries resulting from single or multiple damages can benefit from 3D scanners. They can also help the assessment of non-pressure-boundary components such as supports. The main limitation of all 3D scanners comes from basic optical rules. These scanners can only digitise the exposed surfaces. This is true for laser-based 3D scanners and structured-light technologies. What is the future of integrity assessment? 3D assessments are not going away any time soon. We are at the beginning of a new era. Older, conventional methods will be slowly replaced by new technologies. Moreover, 3D scanners will continue to evolve and the ones used right now are not the ones that will be used in five years. A great example of this evolution has already started with advanced NDT integrity software, which combines multiple NDT technologies. Since every NDT technique has its own strengths and weaknesses, being able to merge measurement results from the best 3D scanner in the world with the most sophisticated UT measurement techniques is a real game changer! Integrity engineers will benefit from the most accurate and actionable information available to make informed decisions and ensure public safety. 3D scanners are used for pipeline fitness-for-service evaluations and are replacing conventional methods, such as pit gauges and ultrasound probes. 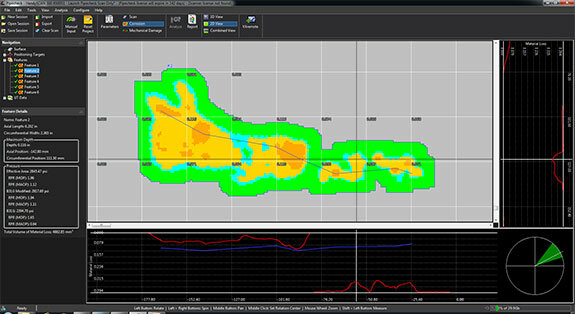 Corrosion and mechanical damage can now be characterised with very high accuracy and repeatability. 3D technology development in the market has definitely set a new standard for integrity assessment in the industry. They are great tools and they provide the safest way to assess the health of pipeline networks. Written by Jérôme-Alexandre Lavoie, Product Manager, Creaform.